This is the story of Miles Lord (1919–2016), who rose from humble beginnings on Minnesota's Iron Range to become one of the most colorful and powerful judges in the country. This is a sweeping and spirited true-life tale by Roberta Walburn, who was the judge's law clerk, This book includes first-hand experiences and unrestricted access to the judge's personal files. It is a rare and compelling portrait of a remarkable man and his place in both Minnesota and U.S. history. Ms. Walburn has recently been nominated for best non-fiction book in the 30th Minnesota Book Awards. Award winners will be announced at the Minnesota Book Awards ceremony on Saturday, April 21, 2018 at the InterContinental St. Paul Riverfront Hotel. A must see for all Minnesotans, this documentary film captures the enduring spirit of Miles Lord and his tireless pursuit of justice for the "little guy." Watch the film here. Born in 1919, in Crow Wing County, Minnesota, Judge Miles W. Lord was called "the champion of the working man" for his unending commitment to the environment and for forcing giant corporations to do right by average citizens harmed by their products or business practices. Whether on the bench, in pubic service or in private practice, Miles Lord worked diligently to obtain justice for citizens from all walks of life. He encouraged his daughters, Virginia and Priscilla to study law. "He was a mentor in every sense of the word," says Priscilla Lord. 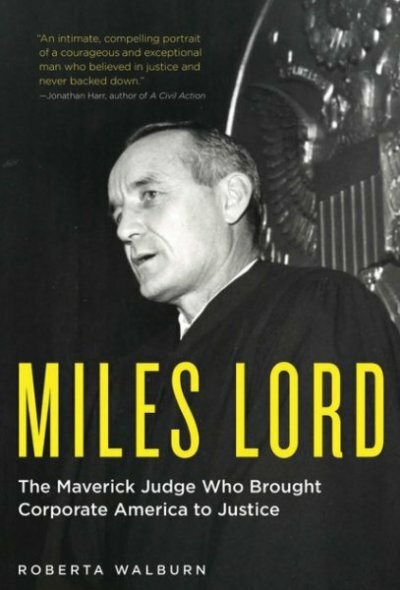 Miles Lord died in December 2016, leaving Priscilla and the Lord & Heinlein team to continue the legacy of "The People's Judge" by doggedly pursuing fairness for their clients. In 1973, Judge Lord stopped Reserved Mining from dumping 47 tons of taconite tailings into Lake Superior every minute. Later studies showed the processed taconite tailings contained cancer-producing asbestos fibers. Lord said in his decision, "This court cannot honor profit over human life." According to Judge Lord's former law clerk, Roberta Walburn, "Miles believes to the very essence of his core in the concept of 'Justice'. This is what drove him and it was an amazing experience for me to work with someone who was so passionate about justice and to see how that passion can become a reality in the courtroom." In 2015, Twin Cities' 7th grade student, Per Anderson, received a regional award for showcasing the life and work of Judge Lord in this biographical website "Judge Miles Lord: United States vs. reserve mining". Judge Lord presided over a pre-Title IX case where two female high school students were denied the right to compete on the boys' swim and tennis teams. No such girls' teams existed at that time. He ruled for the girls after hearing testimony from the Minnesota State High School League whose expert testified that, "Girls' bodies were not suited for such strenuous competition." His ruling came two months before Title IX was passed. Maggie Faris, Lord's oldest grandchild played on the Minnehaha Academy soccer team and competed in a Junior Olympics slalom ski racing tournament. Emma Faris competed in soccer and played on the first girls' hockey team at Minnehaha Academy. Jessica and Catherine Pollock (twin granddaughters) are figure skaters who both competed in the final game of the 2009 Minnesota State High School Girls Hockey Tournament for Hopkins High School. A dangerous product, which lacked proper testing, the Dalkon Shield was used for birth control. It caused serious infections and permanent sterility. After years of stonewalling by the company, when Judge Lord became involved he ordered the executives to be deposed and discovery to be completed which quickly resulted in a mass settlement. Later, he earned notoriety for holding top officials of A.H. Robins Company accountable for the thousands of injuries suffered by women who used the company's Dalkon Shield intrauterine birth control device. In open court, Judge Lord lectured the top executives of the company holding them personally liable and stating that, "Once they put a price on human life, all is lost. Life is sacred. Life is priceless."